Los Alamos National Laboratory molecular biologist Amanda Barry inspects mini-ponds of algae at the greenhouse July 26 at the New Mexico Consortium building in Los Alamos. The algae are being grown under natural light to mimic small outdoor algae production ponds with moving paddles to provide air and to distribute light evenly. 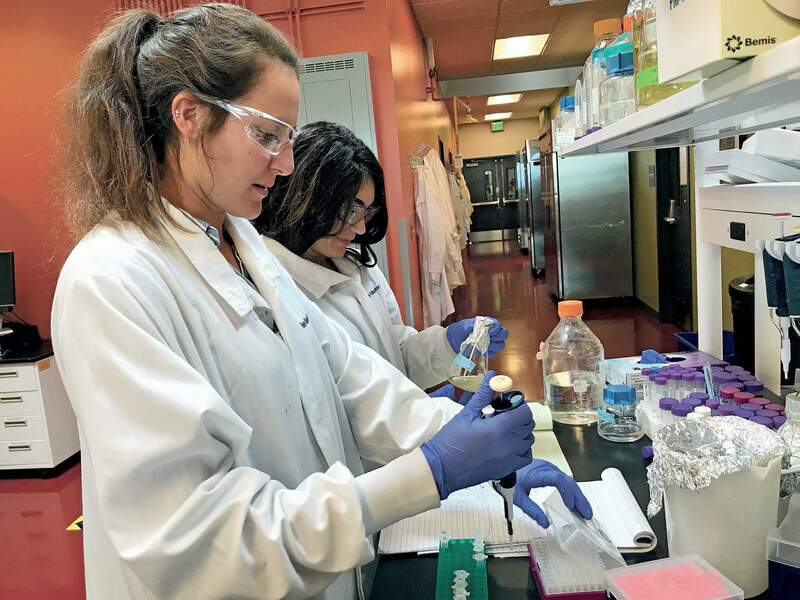 Los Alamos National Laboratory researchers Jenna Schambach, left, and Sara Lamcaj, examine algae cultures and count cells in experiments to see if algae can become a viable biofuel. 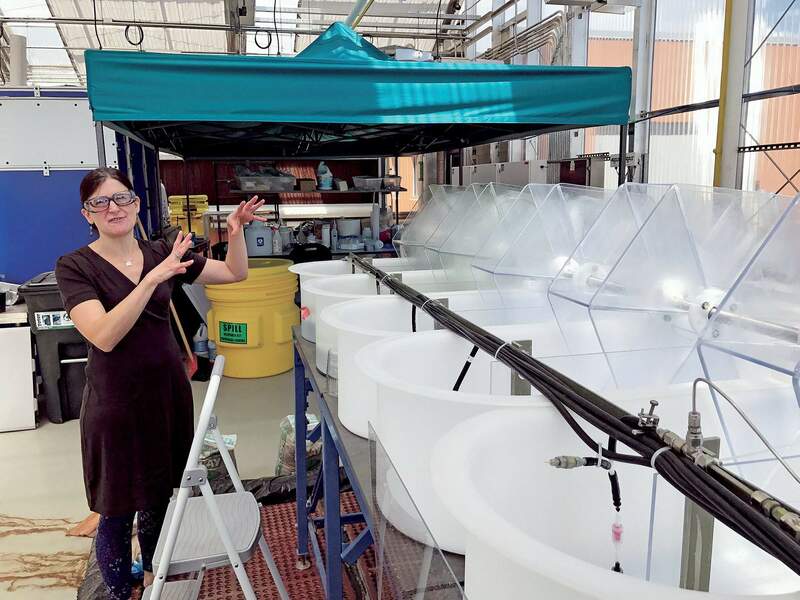 Los Alamos National Laboratory molecular biologist Amanda Barry inspects mini-ponds of algae at the greenhouse at the New Mexico Consortium building in Los Alamos. The algae are being grown under natural light to mimic small outdoor algae production ponds with moving paddles to provide air and to distribute light evenly. 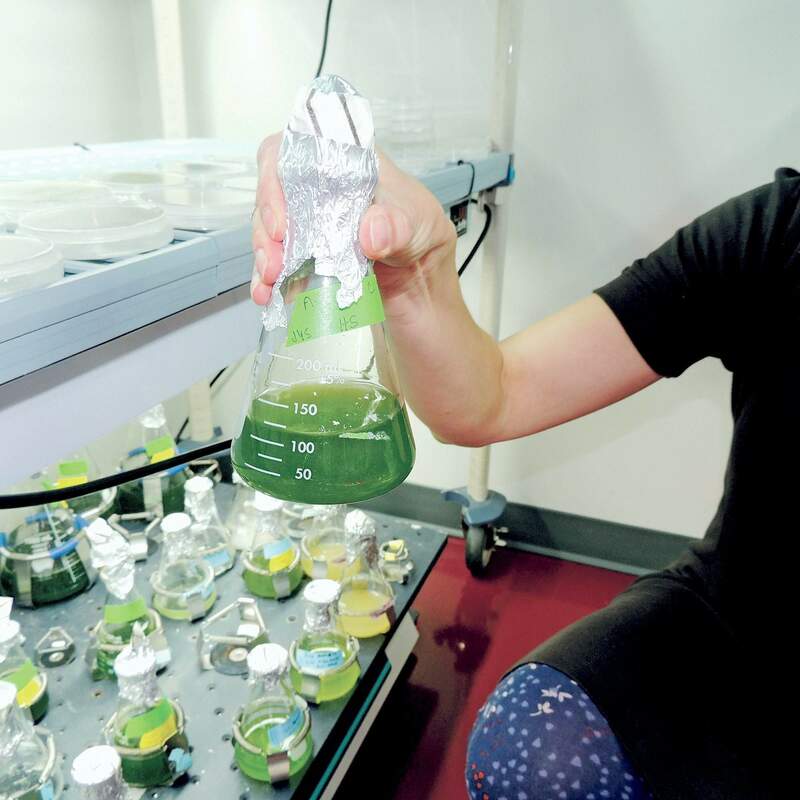 Los Alamos National Laboratory molecular biologist Amanda Barry holds a particular strain of algae that researchers are working with to see it could be cheaply massed-produced for biofuel for cars, trucks and planes. SANTA FE, N.M. (AP) – That green pond scum on the backyard pool may be annoying now, but it could someday fuel a jet plane to whisk you away on vacation. And those lawn clippings? They could be used to convert algae into a mass-produced, economical biofuel to be used in cars, trucks and airplanes. 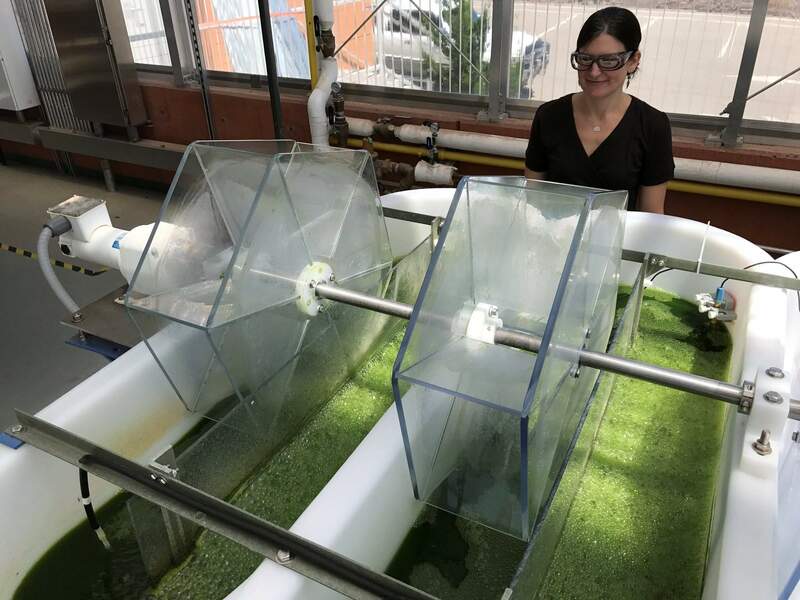 Molecular biologist Amanda Barry and a team at Los Alamos National Laboratory’s Bio-energy and Biome Sciences group are trying to determine whether one particular strain of algae can be produced at low cost and in short periods of time so that it could economically compete with fossil fuels. “Algae hold great potential as a source of renewable fuel due to their ability to produce refinery-compatible diesel and jet fuel precursors,” Barry said in an interview last week at the New Mexico Consortium’s lab in Los Alamos. The consortium is a nonprofit corporation formed by three New Mexico universities to facilitate research and increase cooperation between academia, industry and Los Alamos National Laboratory. Algae, of which there are many types, already are produced in large quantities in big outdoor ponds. But doing it faster and more cheaply is the trick. And though biofuels, such as ethanol made from corn products, have been produced for a long time, algae could be an improvement – in part because a wide range of oil products can be extracted from algae. The long game, Barry said, is finding a new domestic source of renewable biofuels and bioproducts. By doing that, “we reduce our dependence on fossil fuels, enhance the energy independence of the United States, secure energy solutions for clean energy, mitigate the impacts of global energy demand growth, and contribute to job creation in a new domestic industry,” she said. As a child growing up in the mountains of Northern California, a 20-minute drive from the nearest neighbor, Barry started reading about Marie Curie, the famed French-Polish discoverer of radium and polonium. She never questioned that she would become a scientist. Barry acknowledged that she was influenced by women in science and hopes to pass that on. “I try to be a role model for women and for girls, especially in science, and talk about my own experience so that they see that and have people that they can look up to and hopefully see that it’s possible to do what they want to do,” she said. She originally was interested in physics, “but I didn’t like being inside all day in an office and working on paper; I wanted to work more with living systems and so I got more into biology.” Barry has worked at LANL for six years. She said she loves the study of algae because it’s such a diverse organism that we are only beginning to understand. “There is so much we don’t know about algae and that we can really tap into,” she said. In her work at the lab, Barry is being assisted by three LANL student researchers: Anna Finck of Las Vegas, New Mexico; and Jenna Schambach and Sara Lamcaj, both from New Jersey. They were busy last week as they examined algae cultures and counted algae cells to monitor growth. Schambach said one thing she has learned from the experiments is that the strain of algae they are working with “can utilize different plants” for a food source for growth. The work so far has been in small containers but is currently being transferred to a larger venue – a greenhouse just down the hall. The paddles help give the algae air and keep it moving so light is uniformly distributed. After algae are harvested from large outdoor tanks, it is converted into biocrude oil and can then “be put into the existing refinery system to make biodiesel, gasoline and jet fuel,” Barry said. In the future, LANL will look for an industrial partner already growing algae outdoors “to work with them to see if this would help their process in actually boosting growth and boosting the products they are looking for,” Barry said. While algae may be a future superstar in the biofuels research arena, it is not the lone ranger. About 30 people at LANL are engaged in all sorts of biofuel research, which has been going on since 2009, said Babetta Marrone, senior scientist and biofuels program manager.